Northern Expressions Needlework: And finally some pictures! Admittedly, not great ones. :( I borrowed a camera and have played with seemingly every setting but I can't seem to get them right. But there is a degree of urgency with Nashville coming so I'll have to make due. Saving my pennies now for a new camera! So first of all we have Daffodil. :) I have a few errors in the chart to correct, and then will be sending her along to ECS for the Nashville show. 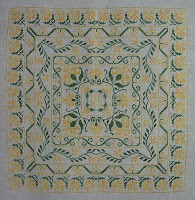 She's stitched on 40ct Lakeside Magnolia Linen, with Gloriana Narcissus and Summer Foliage. The chart will include a DMC conversion, as always, though you could use any yellow/green combo you like and I'm sure it will be beautiful. 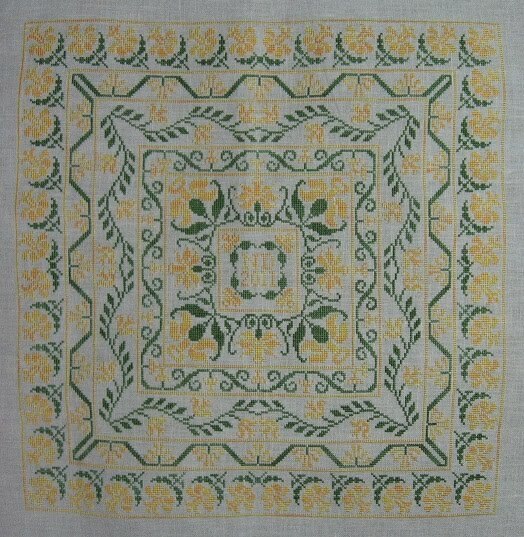 The design is all full cross stitches, so it can be stitched on ANY fabric you choose. I'll tell you this - natural light, flash... doesn't matter. Yellow doesn't photograph well. I decided to put her aside for a little while and have been working on Rhapsody in Red for the last couple days - when I've been able to stitch. Long story short - snow/ice storm, large drifts hiding the porch steps, and I fell down them. I've bruised my tailbone and my sciatic nerve is pinched. I don't work again until Saturday, hopefully I have a bit more mobility back by then!! I went to see Brenda on Tuesday - she's working on Hearts Entwined. I LOVE the fabric colour she's chosen for it. She's doing it on Rue Green Belfast - the silvery green looks perfect with the green and pink she's chosen to stitch it in. It's really lovely. And I FINALLY got a copy of the American Sampler. I don't know what fabric I'll use, but I'm pretty much set on using the AVAS for it. I might change a few colours, but I probably have most of what I need already. Won't be starting it for ages and ages, I'm kind of in the mood to finish some stuff - or at least work towards finishing some stuff. I hope you feel better soon! Sounds like a nasty fall. Your work is beautiful, as always. Sorry I missed you at Brenda's. you poor baby, trust you to hurt yourself when things are going along nicely with your stitching, sort of thing i would do! i hope your back pulls itself together soon! JM & Irene, it may be a bit painful, but it is a funny story and I can laugh about it now. I couldn't get up right away, was laying there in a 3 ft snow drift and was throwing snowballs at the bedroom window to wake Jon up to come out and help me. Comical really. I'm attempting work today, we'll see how it goes. I'm still not moving very quickly. Oh my! I hope you are feeling better soon! This weather is the pits! I hate all the snow we've been having! Sabrina is beautiful, and I love the Daffodil! BTW, saw the mystery SAL on the GOS magazine website! WOW! Wonderful! Congrats!